Nick on IT: Microsoft marries Nokia, finally! Ballmer and Elop finally get it together and have announced that Microsoft will be buying Nokias mobile phone business. The deal comes at a time that Steve Ballmer is stepping down as CEO. 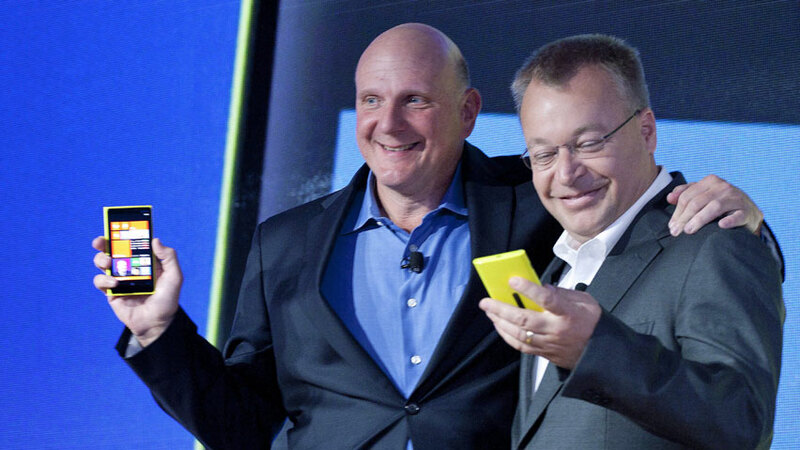 Stephen Elop, Nokia CEO and ex Microsoft, under fire by Nokia shareholders for focusing too much on Microsoft technology, looks set to become the new Microsoft CEO. The Microsoft purchase is an obvious one (i thought it would happen in 2011): pretty much the only thing Microsoft can do to keep Windows Phone a potential player in the mobile OS business. Granted, Microsoft will now be competing head on with "partners" Samsung et all and might have difficulty getting other handset manufacturers to bundle Windows. However, the mobile device market is just too important and Microsoft must move aggresively to retain its industry leading position. The money involved is reasonable at $ 7,2 billion and considering the cash Microsoft has, its a steal. This sure looks like Steve Ballmer's parting shot. An excellent one that makes Microsoft appear much less rooted in old style desktops and more focused on the future: mobile devices. It's Google vs Microsoft again. Apple has no vision and it's the usual 'hit and run' fashion apparel. The future is interoperability. Iphone's future is doomed and Microsoft is better set than Google in this regard if it manages a slimmer Windows Phone OS on the Nokia platform. This is quite a debate. I give you a case of the Maltese government as an example. The tablet for every student will simply not happen until Microsoft come up with a slimmer tablet OS, which is the only platform that will run latest drivers for Interactive Whiteboards and provides hassle free integration with existing Windows 8 school platforms. Most companies are refusing to build widespread driver support for Android and iOS. And with interoperability being the name of the game in the future, I really do not see Apple cutting it out, moreover now that Jobs's re-inventiveness is gone. I foresee Apple hibernating for a very long while like it happened when it struggled for the PC market share against Windows. It simply does not have the reactionary instinct of Microsoft. It is a trend setter, which provides them with short term cash cows until they are overwhelmed by formidable competitors in the long term. I will buy my Apple shares after Microsoft releases its second integrated Nokia mobile phone and the 3rd generation Surface tablets ;) Apple will be rock bottom. Before then, I beg to be surprised.